In the research project described below, Dr. Kerstin van den Dool examines to what extent the subjective experience during a sound massage can also be objectively measured. Through measurements taken during a sound massage – in the course of an intensive training week as well as at the concluding seminar 100 days thereafter – neuronal effects of sound massage of the participants could be established via EEG spectrum analysis as well as measurements of visual and auditory classification thresholds and compared to a control group for the first time. Can the subjectively perceived effects of a sound massage be objectively measured? Which measuring methods are applicable? What is the effect of a sound massage? For over 25 years, the Institute for Communication and Brain Research in Stuttgart-Feuerbach has focused its research on the areas of learning as well as advancement for individuals with a cerebral injury. Clients include children with learning disabilities, adults with difficulty concentrating or wishing to improve performance in areas such as management or competitive sports, and individuals who have suffered cerebral injury. The institute specializes in the therapeutic application of music, in particular, the music of Mozart. 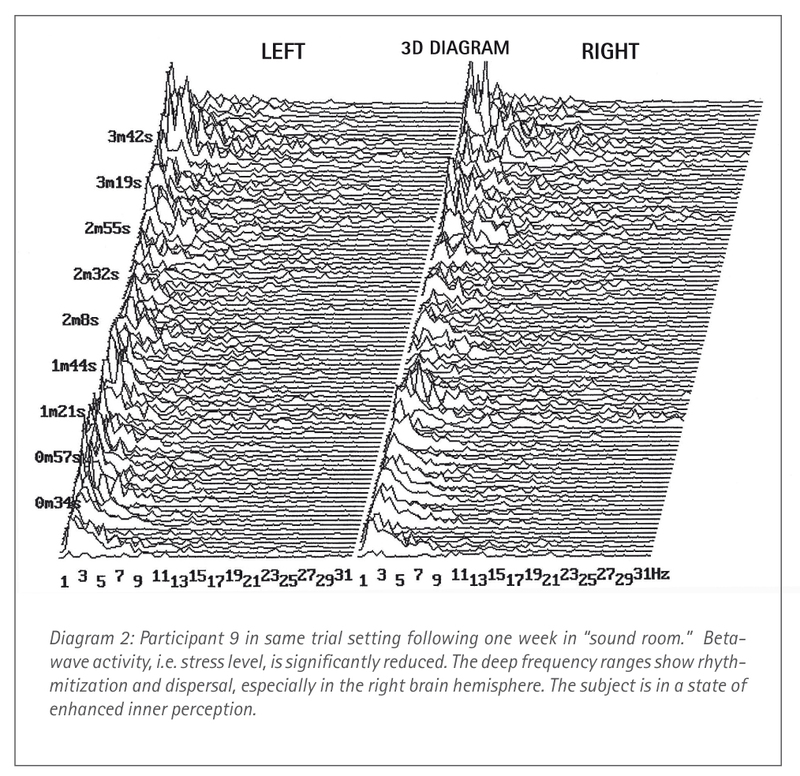 The EEG spectrum analysis developed by Günter Haffelder at the Institute for Communication and Brain Research is a standardized measuring process in which brainwaves are recorded via a 2-channel EEG. 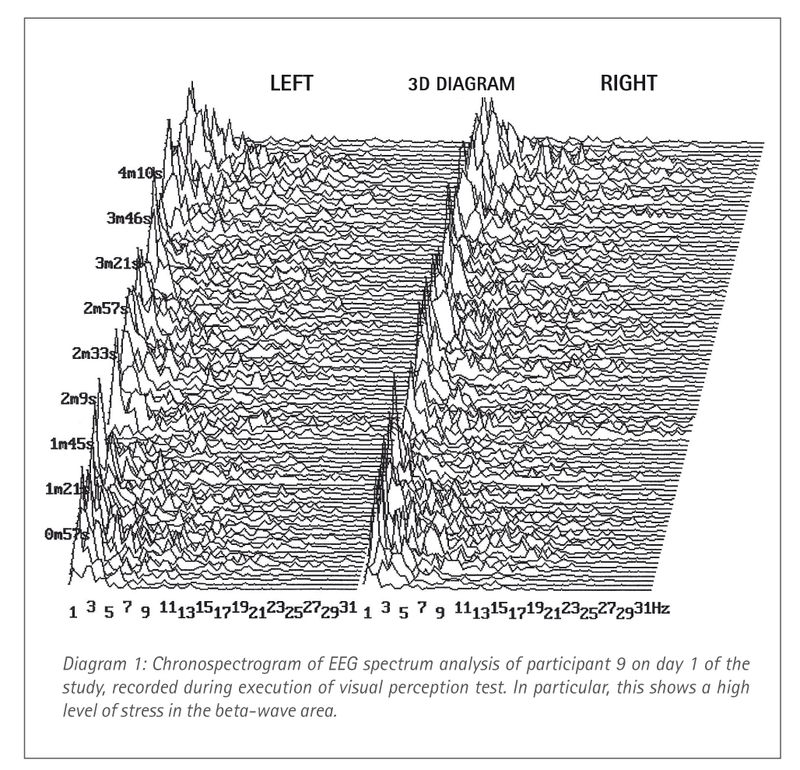 EEG signals are separated into their respective frequencies through spectrum analysis calculations and represented in 3D over time in a chronospectogram. Two chronospectrograms of the same person, recorded before and after a week of intensive training in sound massage for example, can be compared with one another, and potential changes in brainwaves documented. Furthermore, the software allows for enlargement of specific windows of time in the chronospectogram. 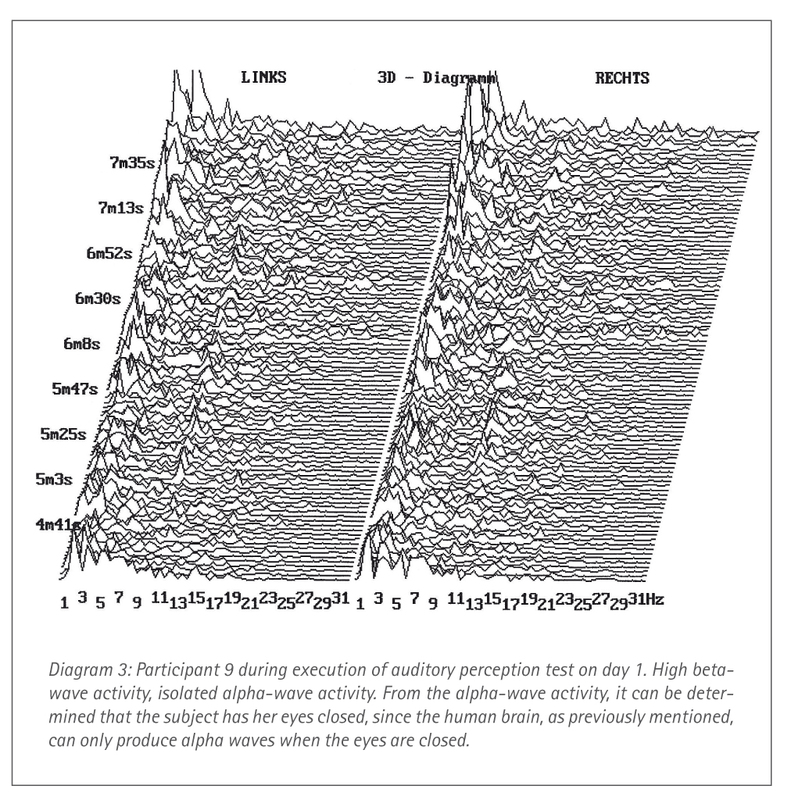 Using the measuring protocol, direct reactions in the imaged brain waves, for example to individual sounds of the singing bowls during a measured sound massage, can be tracked and examined. On the measuring points used (mastoid process directly behind the ear and forehead) brain waves especially from the midbrain, frontal lobe, and, temporal lobe are recorded. Brainwaves therefore originate from the auditory cortex and the limbic system, among others. The limbic system, which controls the hippocampus and amygdala, is an important site for the processing of emotions and bodily sensations such as pain. It also plays an important role in learning and memory. A typical frequency image of a Haffelder EEG spectrum analysis shows rather low beta-wave activity in subjects at rest. Theta and especially delta waves can have comparably high amplitudes; alpha waves normally only occur when subjects’ eyes are closed. Relaxed concentration, calm, composed thinking. To record comparable brainwave signals in the first place, it is important to consistently stimulate subjects in the same manner. The classification threshold test may be applicable in this case. When two sensory stimuli, for example in visual or acoustic form (e.g. two blinking lights or two sounds), are presented to human subjects in short succession, there is a moment when, after the interval between the two stimuli is continually shortened, the subjects can no longer differentiate which stimulus was presented first. The time interval in which two stimuli are still recognized as distinct and can be correctly assigned in time is approx. 50 to 100 milliseconds. The measurement of the classification threshold thus provides information regarding the stimulus processing speed of the brain. In the study that was conducted, the classification threshold test was used to focus the trial participants, potential results of the test were secondarily examined. The study group included 15 participants of an intensive training session of Peter Hess sound massage that was held at the Rhön Academy Schwarzerden in Gersfeld. The control group consisted of 5 employees of the seminar centre who did not participate in the training but were regular employees. Education level, median age, and gender distribution of the two groups were comparable. For follow-up measuring after 100 days, 10 participants of the trial group and 4 participants of the control group were still available, also of comparable gender distribution. At the beginning and at the conclusion of an intensive training week (66 hours of instruction over 8 days), which encompassed several daily group and one-on-one sessions with singing bowls, brain waves of study participants were recorded. 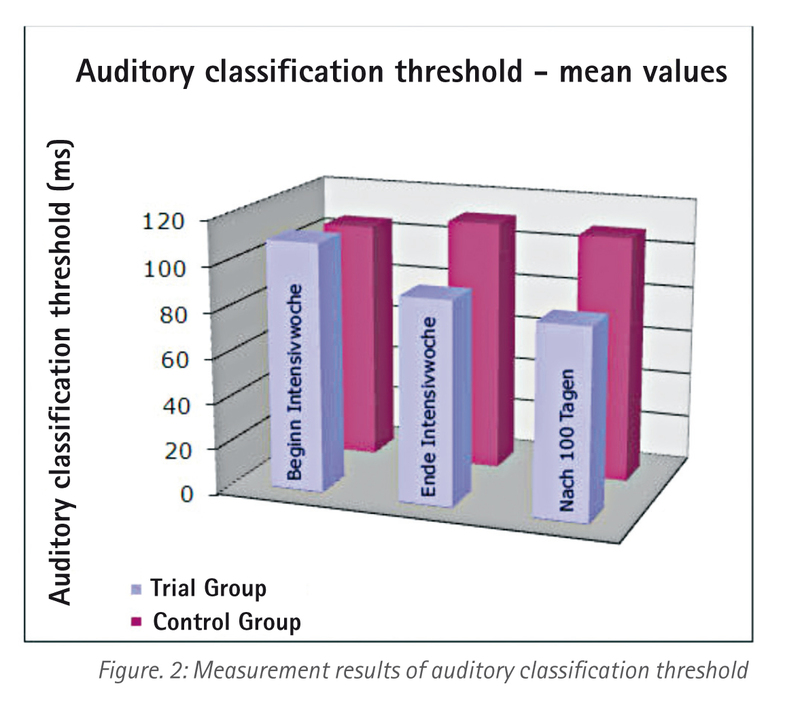 The visual and auditory classification threshold test was conducted during recording. Within the context of the concluding seminar incl. supervision that was part of the training (Friday evening to Sunday noon), classification threshold measurements of course participants could be repeated after 100 days. At the concluding seminar, participants also filled out a non-standardized questionnaire to assess their personal stress level during the study period and its possible origins, as well as the number of sound massage experiences they had in everyday life (in the interval between intensive training week and concluding seminar). 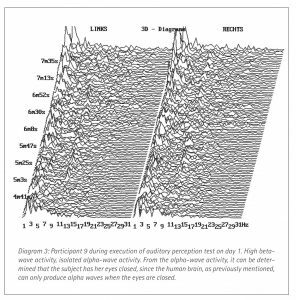 Additionally, during the study period, the brainwaves of individual participants during a sound massage were randomly recorded and examined. Overall, it was observed that brain processes of the study participants became more rhythmic. The beta activity of trial participants was significantly reduced after the week of sound massages, meaning that a visible reduction in stress had occurred. In the control group on the other hand, beta activity rather increased by the end of the regular work week. In the trial group, alpha activity increased; blockages were reduced. A significant part of the study subjects additionally showed synchronous brain activity following the week of sound massages, which points to improved collaboration of the two brain hemispheres. Theta activations, on the other hand, were not significant in both the trial group and the control group. This can be explained by the structure of the trial. 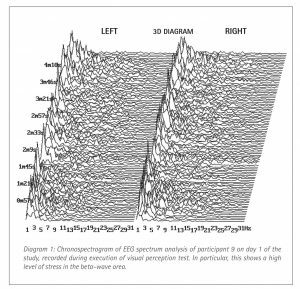 During the entire time of the EEG measurements, subjects were occupied with the classification test and therefore did not have room to create inner images. 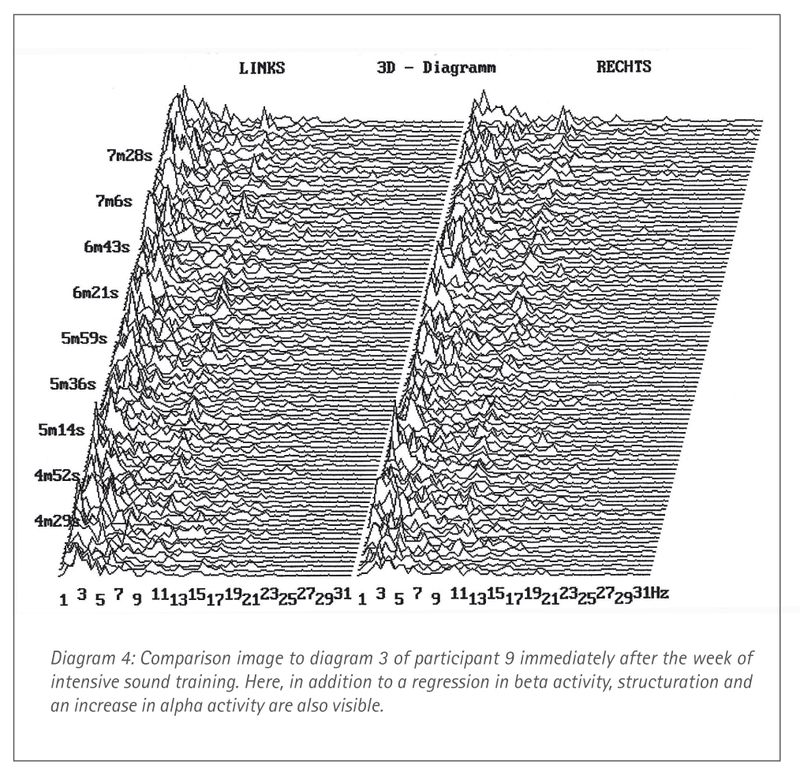 By comparison, when participants were individually measured during a sound massage, there were obvious signs of a theta-wave pattern (see diagram 2). 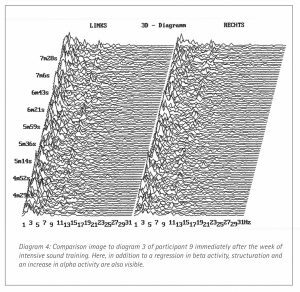 With regard to delta rhythm, a significant part of study participants showed reduction in delta amplitude after the week of sound massage training. The classification threshold test that was conducted provided several results: in the area of the visual classification threshold, there was a significant increase in perception following the intensive training week in the trial group. After 100 days, the value was somewhat reduced, and settled approx. midway between the initial value and the value directly following the week of training. 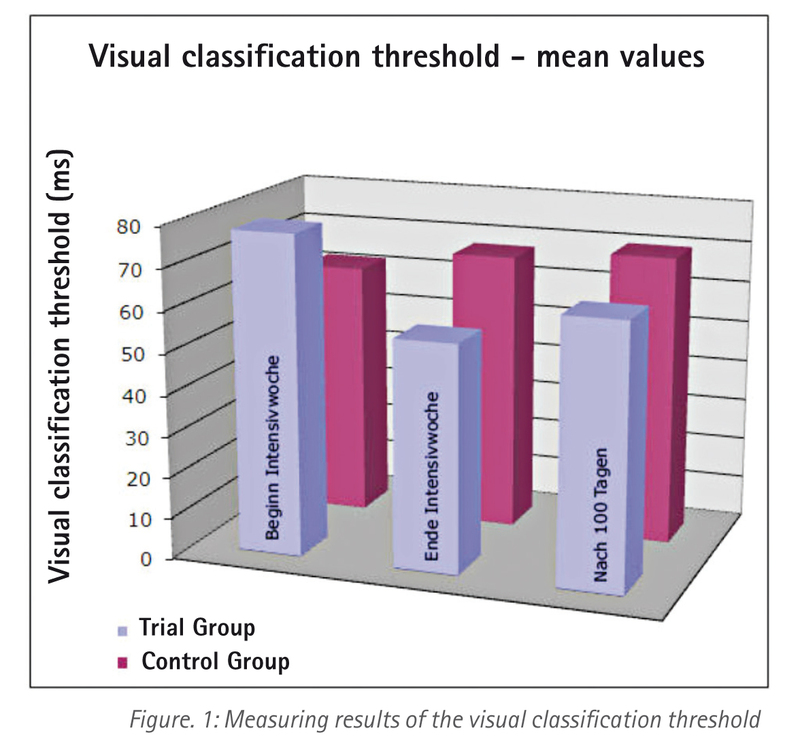 In the control group, the visual classification threshold remained predominantly unchanged and even declined slightly in mean. 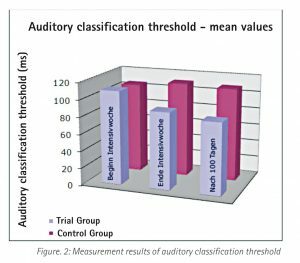 In the measurement of the auditory classification threshold after 100 days, study participants showed stabilisation of the increase in perception that was observed following the week of sound massage training. There were no significant changes in the control group. Measurement of the classification threshold was thus shown to be a potential parameter to document increased stress; additionally, the results of the control group indicate that a “practice effect” can be ruled out. The mean stress level was assessed on a scale of 1 (very low) to 6 (very high) by trial participants on average at 4.25 prior to training and at 1.55 points immediately following the week of training. After 100 days, the mean of subjective stress assessment was 3.35 points. Professional and personal causes of stress were indicated in equal amounts. The number of sound massages between the week of training and the concluding seminar did not have any correlation to the personally observed long-term effect following conclusion of the week of training. Half of the participants observed a change in stress level that lasted up to approx. 1 week following the training; the other half observed a change that lasted for several weeks; 2 participants indicated changes that persisted to the 100th day, the day of completion of the questionnaire. In the randomised EEG measurements during a sound massage, participants showed measurable reactions to individual sounds. For example, when the pelvic bowl was placed in the middle of the back, subject 1 was able to relax deeply. Placing a joint bowl to the soles of the feet resulted in a similar effect, additionally, in the right hemisphere of the brain, strong delta and theta activations were observed. If a heart bowl was struck in the area of the thoracic spine, the subject was more awake and “counted” the strokes in her left hemisphere of the brain. The subject especially showed distinct delta activation upon direct interventions by the therapist. She thus had measurable responses to all kinetic stimuli, for example, a hand touch by the therapist prior to placement of the bowl on the body of the subject. Right and left hemispheres of the brain have different responsibilities and ways of functioning in humans. In right-handed individuals, the left hemisphere is responsible for conscious processes; it functions in a linear and logical manner. Here, awareness of the self is created and, for example, the ability to integrate oneself in place and time, to find and speak words to identify something. The right hemisphere, on the other hand, functions holistically, timelessly, and in images, and houses the intuitive, creative, and physically oriented and generally unconscious processes. Receiving a sound massage is an experience. The sounds and vibrations of the singing bowls reach and touch humans deeply and on several levels, physically, emotionally, and spiritually. Subjectively, the stress level is reduced, good relaxation is possible. The conducted study was able to show that a sound massage has neuronal effects that can be objectively measured: represented by sustainably altered brain waves and also measurable by a changed perception speed in trial participants. Further studies should follow. These first measurements also showed great influence by the person giving the sound massage on the person receiving the sound massage. A sound massage makes recipients “very open” to all actions and interventions by the therapist. These results should be incorporated into the training and further education programs of the Peter Hess Institute and inspire all who work with sound massage to continue to strive into the direction of intuition and attentiveness. 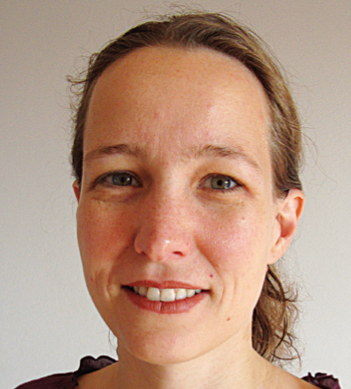 is a physician at Charité Berlin and also has her own practice in Potsdam. 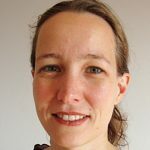 She has a degree in the field of experimental fundamental research and has collaborated for many years with the Institute for Communication and Brain Research in Stuttgart. For a long time, she has focused on music and sounds. While deployed in a medical capacity in Nepal, she met Peter Hess in Bhaktapur. It was there that the idea for this research product was developed. ⟵Klanggruppen beim Netzwerk Stimmenhören e.V. Klanggruppen beim Netzwerk Stimmenhören e.V.